First things first, let me be honest here… I’ve never played either of the Bloodrayne games, nor have I watched the Bloodrayne movie and it’s two direct-to-video sequels. In fact, I was so out of touch with the franchise before playing Betrayal that I didn’t even realize the main character was (at least partially) a vampire. Luckily, as I understand it, the only similarities between Bloodrayne: Betrayal and its predecessors are the story and characters. 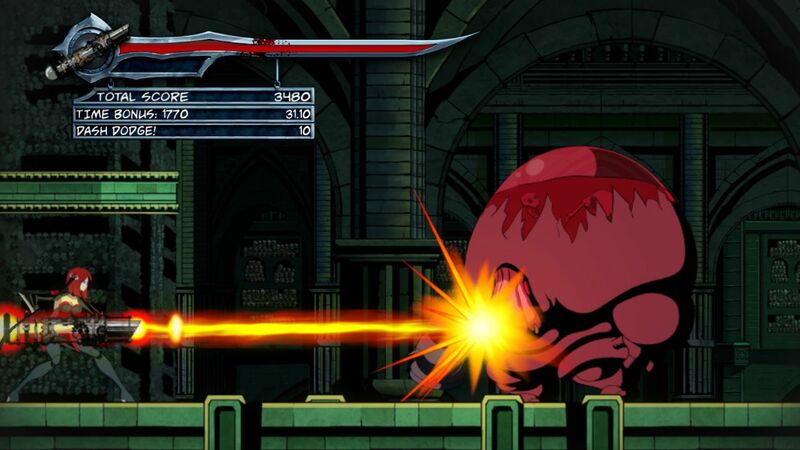 Jumping from a 3D action-adventure game to a 2D sidescroller was an interesting move by Betrayal developers Majesco & Wayforward, but with their new take on the series, it was quite a pleasant surprise to me. I’m a sucker for any cel-shaded / cartoon style video game, so I was immediately drawn in when I first gave Betrayal a shot. 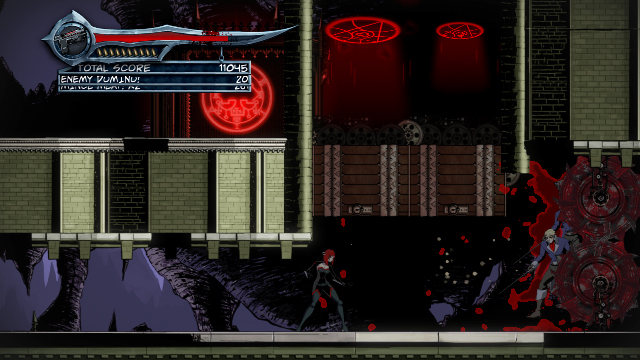 Both the characters and backgrounds are drawn so sharply, complementing the feel of the game very well. 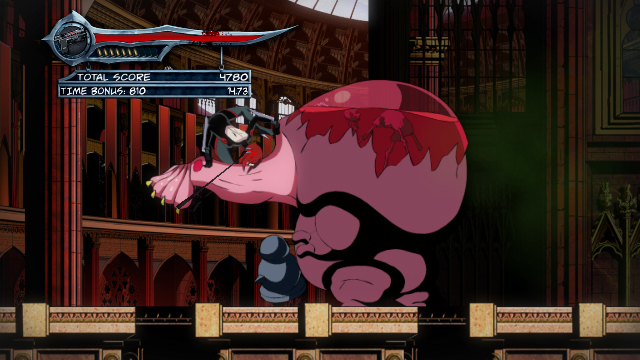 The character animations are quick but clear, allowing the player to see the carnage they wreak on vampire, electric frog, giant mosquito, and mummy clones alike. While the visuals of the game were what first drew me in, the gameplay is what got me hooked. The combat mechanics are extremely fun. Shooting, slicing, and dicing badies is extremely satisfying, especially with handfuls of them at a time. This is where combos come in big time. 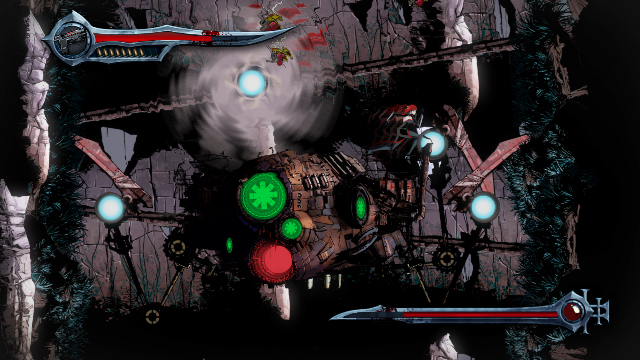 Survival is solely based on multiple consecutive attacks on large numbers of baddies. What really makes the gameplay fun, however, is her defensive moves. Jumping, wall jumping, jumping off enemy heads, dashing, blood sucking (for health replenishment and undead makeshift bombs), and backflipping fill out the list. I literally spent twenty minutes just playing with these moves. 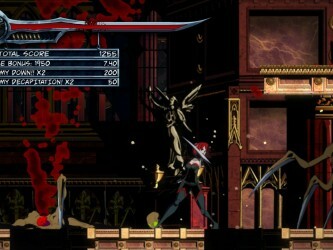 After the completion of each chapter, the player is graded on style and how fast they were able to make it to the end. Granted, I never got above an “F”, but I’m not quite sure that’s even possible. The sound effects and music only add to the atmosphere of the dark and gloomy castle grounds. 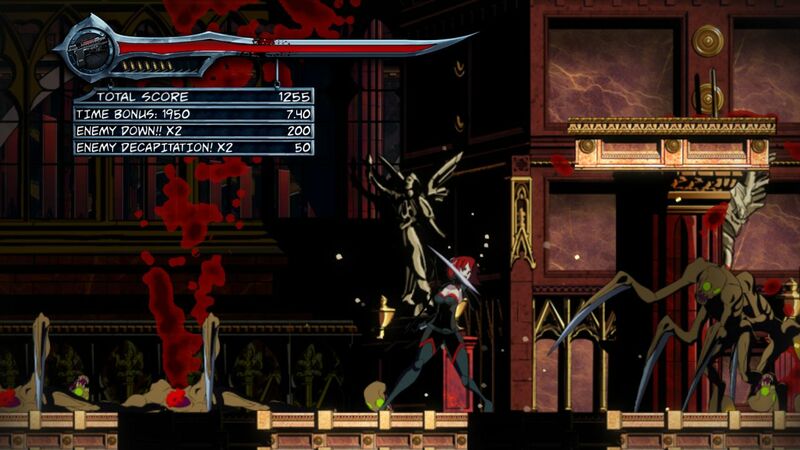 Every attack Rayne makes is impactful, especially when she whips out her magnum and blasts a view enemies. What earns the developers some big points here is the soundtrack is very reminiscent of the old Castlevania days, earning nostalgia points amongst players. The story isn’t the focus of Betrayal. Rayne, a half-vampire / half-human (or Dhampir) is on a mission to seek out and destroy her father, Kagan, once and for all. Aided by a useless army, she storms his castle, destroying anything that dares to stand in her way. That’s… about it. While the story is a bit thin, the gameplay and ambiance make up for it. If you want more story, go watch Uwe Bowl’s Bloodrayne Trilogy. No, no… I’m kidding. Don’t do that… please. All in all, being my first venture into the Bloodrayne realm, it almost makes me want to take a step back and play the preceding games. 8.2 / 10: Cheesy and campy sidescrolling fun at its best.